The species is widespread in coastal Britain, but inland records are patchy and scattered, restricted to suitable habitat. 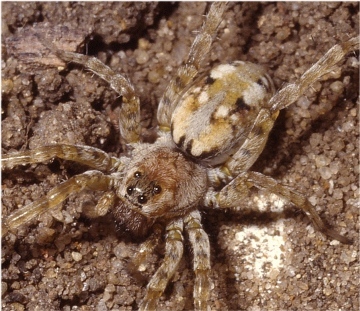 The range of this spider may be increasing with new records inland. It is widespread in western and central Europe. A species strongly associated with sandy coasts and heathland habitats. In coastal dunes, the spider shows strong positive correlations with bare ground and the sparse vegetation that surrounds it (Bell & Haughton 1995). A. perita has been identified as a frontal dune specialist, but it has also been recorded outside this habitat on inland heaths, old ironstone workings, river banks and old sand and gravel pits. Within the loose substrate that is abundant at these types of habitat, the spider builds a well-concealed retreat burrow. The spider has been collected between February-November, with two activity peaks, one in spring and the other in autumn (Merrett 1968). However, it is thought that female spiders may over-winter as adults. Our data show a main peak from late spring to mid-summer and a smaller peak in the autumn.